MULTINATIONAL ride-sharing company Uber was knocked back from holding an “information session” at Mornington Secondary College last Tuesday evening. The purpose of the session included signing up new drivers. Acting principal Jim Papas confirmed the school had cancelled the booking once it became aware of the recent Melbourne Magistrates’ Court conviction and fine of an UberX driver for operating a commercial passenger vehicle illegally. “We decided not to associate with the service if it is illegal,” he said. Despite the knockback, Uber managed to move its session to The Grand Hotel. Uber spokesperson Katie Curran said: “We have hundreds of partners who live on the Mornington Peninsula and we routinely run information and outreach sessions right across the markets we serve to provide support to our existing driver-partners and help new driver-partners on to the system. Uber’s appearance in Frankston and on the Mornington Peninsula is concerning regular taxi drivers, who fear their livelihood will further slip away to the hip new service, which doesn’t have their in-built costs (‘Uber’s arrival challenges taxi operators’, The News 20/1/15). It’s especially galling to established licence holders who see their investment falling in value by more than half. Long-standing Mornington taxi driver Ross Sanders is outraged that Uber can “thumb its nose at the rules and regulations and get off scot-free”. He said starting up a regular taxi driver on the peninsula cost $22,703 in licence fees, followed by full insurance and on-road costs, whereas an Uber driver “could start up for free at the drop of a hat”. He claims it is unfair that taxi services, having factored in high-price licences, full driver training and accreditation, comprehensive insurance, GPS, security cameras and tactile signs, can be undermined by a foreign service that moves in for free and takes away their business. “Uber is a tragedy waiting to happen,” he said. “I carry all the necessary requirements and, if a passenger feels threatened by me, they can call the police and I will be off the road in five minutes. The fining of the UberX driver is cold comfort, too, because it’s believed that Uber pays the fines and the driver is free to break the rules all over again. “In typical fashion, Uber continues to have no regard for the law and encourages others to break the law, putting at risk the safety and wellbeing of both drivers and passengers alike,” he said. A driver for 28 years servicing the eastern side of the peninsula, Mr Sanders said taxis were “up against it”. “We’ve come through the [Allan Fels] taxi reforms and out the other side and now Uber is on the scene and it’s a whole new kettle of fish,” he said. Taxi Services Commission chair Graeme Samuel said competition in the taxi and hire car industry “must be done within the confines of the law”. “[The 2 December Melbourne Magistrates’ Court] decision vindicates the actions taken by the TSC to enforce the law as it currently stands,” he said. 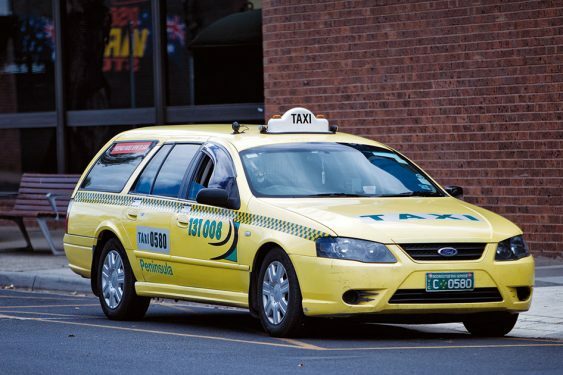 Despite the use of the term “within the confines of the law”, Mornington Police Senior Sergeant Brett Coloe said the Victorian Taxi Directorate was the responsible authority for managing and enforcing rules regarding Uber drivers – not police. He said Uber “as a body” was not illegal, rather “it’s the actions of the drivers that are illegal”. Senior Sergeant Coloe said the recruitment sessions did “not amount to inciting drivers to break the law”. He was unsure whether Uber passengers – like the drivers – were breaking the law. Mr Samuel said the TSC was committed to enforcing the law and had acted consistently by holding drivers acting illegally to account. He said the “wider issue of ride-sharing and its future in Victoria is a policy matter that is being considered by government”. The TSC says it has another 11 matters before the courts for charges similar to the [Uber] matter. Uber says its ride experience “from request to drop-off is geared towards ensuring reliability and safety. “Upon requesting a car, our technology provides the rider with their driver’s name, photograph, licence plate, vehicle type, and a contact number. Mr Sanders said “thousands of families and businesses are being decimated by Uber and are unsure what the government is going to do”. He admitted the uncertainty was costing him financially.